A planned certification scheme to prevent warlords funding their militias by selling minerals to European firms has been delayed, EURACTIV has learned, and fears are growing for its future. The EU’s trade directorate had been expected to publish a regulation that would secure uniform compliance across the bloc – and beyond – by the end of this year. But various sources say that one such report has already been rejected by the college, for undisclosed reasons, and no proposal is likely to be adopted until at least February or March. Some fear that the proposal could wither in the Berlaymont building’s corridors, if it does not bear fruit before the institutional changing of the guard that will follow European elections next May. “It's critical that the Commission, with the backing and encouragement of MEPs, keeps the momentum, and at the very least gets the proposal to the point where it will be considered by the next parliament,” he told EURACTIV. Many millions of people have perished as a result of wars in the Congo since 1993. The EU's trade commissioner, Karel de Gucht, has termed it “undeniable” that the trade in minerals intensified and lengthened the slaughter. “Put simply, if armed groups can capture a mine they have easy access to international demand for its production, and therefore easy access to funding for more violence,” he said. In September, de Gucht flagged an EU legislative decision on stopping the 'blood' minerals trade by the end of the year. But, speaking at a conference in London on 13 November, Signe Ratso, a senior official in his directorate, would only say that a legislative proposal and communication were now intended “in the next few months”. No reason for the delay has so far been forthcoming but campaigners say that policy-makers have been lobbied hard by 12 large German mineral extraction firms, even though major corporations such as Philips and Coca Cola are thought sympathetic to a robust law. More broadly, the ‘downstream’ sector – which make use of the minerals in Europe – complains that supply chain-checking requirements under the US’s comparable Dodd-Franks Act are too costly and difficult to enforce. Any EU legislation will need to be compatible with this Act. “To the extent possible, we would like to reach out to upstream players outside EU jurisdiction through the Commission proposal,” an EU official said, on condition of anonymity. But what form this should take is still being debated. Issues at stake include how many minerals should be covered in any new law, and whether firms should face mandatory or voluntary ‘due diligence’ requirements for checking their raw materials’ sourcing. “The most important thing is that this is legislated as soon as possible, and that the legislation involves more than voluntary guidelines,” Sargentini told EURACTIV. EU sources confirm that new laws will only cover gold and the ‘Three T’s’ – tin, tungsten, and tantalum, a material that makes mobile phones vibrate. Campaigners though retort that militia groups such as Colombia’s Farc are known to trade in emeralds and coal, while materiel such as diamonds, rubies and timber have also been used to fund armed campaigns in the Central African Republic, Burma, Zimbabwe and Liberia. “What is the point of European taxpayers' money being spent on mitigating the effects of conflict in countries such as the Congo, when our own companies are buying minerals that fuel them?” asked Sophia Pickles, a campaigner from Global Witness. The view from Brussels though is that diamonds are already covered by the Kimberley Process certification scheme, and that the bloc should take its lead from other international groups. There is a general consensus that the Dodd-Frank Act provisions on source-checking materials acquired from the Democratic Republic of Congo (DRC) or nearby have been a catalyst to international efforts to deal with the conflict minerals problem. Dodd-Frank mandated the US Securities and Exchange Commission to create rules for addressing whether conflict minerals were benefitting armed groups in the DRC, and introduced a ‘due diligence’ certification scheme obliging companies to source-check materials. It also caught European firms operating in the DRC in its net, and this in turn nudged the EU to come forward with its own proposal. Sargentini said that the US law included mistakes that should be avoided – such as a de facto embargo on any mineral trade with eastern Congo – but that any EU regulation should be compatible. 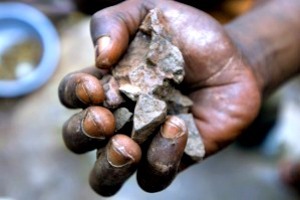 Conflict minerals are minerals mined in conditions of armed conflict and human rights abuses, mostly in the eastern provinces of the Democratic Republic of the Congo. The looting of the Congo's natural resources is not limited to domestic actors; during the Congo Wars, Rwanda, Uganda and Burundi particularly profited from the Congo's resources. The most commonly mined minerals are cassiterite, wolframite, coltan and gold, which are extracted from the Eastern Congo, and passed through a variety of intermediaries before being purchased by multinational electronics companies. Since 2003, the European Commission has been a high profile donor to Congo, particularly in the country’s unstable east. The EU’s Country Strategy Paper for the 2008-2013 period, under the 10th European Development Fund, pledges some €583 million of European funds to the country from DG Humanitarian Aid and Civil Protection (ECHO). This is supplemented by funds from the EU general budget under the Development Cooperation Instrument, and funds for other bodies such as the European Instrument for Democracy and Human Rights, the Instrument for Stability, Eufor RD Congo, Eupol RDC, and Eusec RDC. This web site is extreamly bad. The reason is that the words are written so small that they are not readable!!! and the site has its font set up so that this problem is printed that way – not readable by being too small! !